If you remember, i mentioned before that i was working on my second shoe project and after one week of painting, drawing and spraying, it has finally been completed. I have always been inspired by mystical creatures like dragons, mermaids, fairies and unicorns ever since young when i see mermaid & dragon tatoos on my grandfather's body. Then school introduced me to Shakespeare's plays like the Midsummer Night's Dreams, Macbeth and etc, where the fairy kingdom becomes so real in the play. However silly i may sound right now but i really wish to see a unicorn(a fairy would be fine too) someday because horses are getting boring. Anyway, the reason why i chose the unicorn out of all the other mystical creatures was because of the toy that i saw in Jen's shop. I was so excited when i saw the unicorn and told myself that i had to do something with unicorns so i decided why not on a shoe since i already got a pair of plain white shoes at home. After that week,*TEEHEE*, my second shoe project has been completed. Cheers to unicorns! Toy in Jen's shop. My inspiration. Hey ho, fellows! Stop and stare at the almost psychedelic top that i got from a old fashion shop at Bukit Timah Shopping Centre(Yes, the shopping centre that everybody goes to to look for the perfect maid) I tell you, do not be fooled by the architectural works of the building that may make the mall seems unwanted and useless, you will be amazed and surprised by the treasures in there. The two brooches that i've pinned at the collar of a sleeveless top worn beneath the almost psychedelic printed blouse... Can you see that the two brooches makes the eyes of something and the circular black print over the bigger circular white print actually looks like the nose of a dog, hence it looks a little like a funky funny dog we imagine to see in a cartoon? Oh god i almost got lost in that long sentence. So, yes! The wonders brooches can create to an outfit. Awesome huh. Did you notice that the clutch that i'm carrying is made out of duct tapes and magazines? I used magazines as the base of the clutch to make it less flimsy and the 3 different colour duct tapes to make my clutch more colourful. Reduce, Reuse, Recycle. Good for the environment, my loves. Let's be environmental friendly and save the earth. (I'm sorry these all sound so cliche but these are the only few lines that i can remember when i listen to speeches/debates regarding the environment in school.) Maybe i should just stop talking about being environmental already, i will feel like a hypocrite the next time i throw my can drinks into the dustbin and not the recycling bin. Well, i still made a clutch using magazines and i shall continue to justify myself by encouraging you all to also try to work your right brain a little bit more by reusing, reducing and recycling anything into something usable again. Try it, it can be pretty fun! The long awaited post is finally on Shien! I can't feel anymore excited to share all the pictures that Jen, Issac and I took on Saturday when i drop by the shop situated at The Central, #01-43, 6 EuTong Seng Street, Singapore 059817. SpunkPunkFunk is an amazingly quirky label that believes that people should dress to express,not to impress. 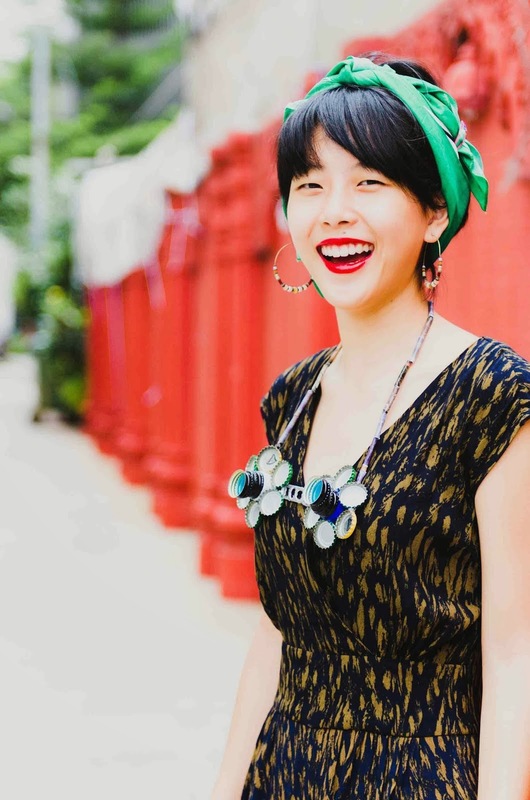 Jen Su, the all-rounder local designer does styling, hair & makeup, makeover, fashion consultation, runway choreography, event coordination and last but not least, designing. Her passion. Isn't she Singapore's pride. The funkalicious designer believes strongly that fashion has no disparity and she encourages people to try & express themselves because Fashion is no discrimination. Personality has more credibility than beauty. C'mon, somebody says amen to that, please. Okay, enough of words, now get yourself ready to dive into a pool of craziness, quirkiness and happiness! Enjoy your journey into the WillyWonka's chocolate factory! *(Random)*Just enjoy k.
You think that they only have clothings in the shop? No way. There are funky and unique glasses&sunglasses in the shop, catering prescriptions as well! Told you Jen was an all-rounder designer. Oh and the biggest secret is that these glasses are FREAKING cheaper than the one that you're wearing on your face now! (Well, at least that applies to me) So please, my lovely readers, I have found the best optic shop for you in town. I dare not lie. Even more obvious than fake eyelashes,bring it on! Customer of SpunkPunkFunk that bought two glasses because he just couldn't decide which one to get. Yesyes. There are the branded ones like Alexandra Wa, Karen Walker, Oliver Goldsmith, Dries Van Noten and of course those that are brandless. However, do not be paranoid about the quality of the brandless ones because a lot of them are made in Japan. with prescription will be extra $30-$50 depending on your degree.